Child-friendly? Whether your little ones are wimpy, brave or anywhere in between, it's a safe bet that they'll relate (especially your pre-adolescent boys) to the classic, coming-of-age hijinks that "wimpy kid" Greg Heffley and his friends get into during a summer stint at a snooty country club. Diary of a Wimpy Kid? I guess this movie is for anyone who couldn't handle this summer's earlier kiddie flick – Brave. 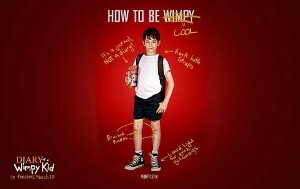 I managed to skip taking my kids to see the first two films in this pre-teen saga (have to thank their mom for jumping on that grenade) so I went into Diary of a Wimpy Kid: Dog Days not really knowing what to expect – except that there would probably a wimpy kid doing characteristically wimpy things. Even with stories I have no vested interest in, I like to do a little background research before getting in over my head. This series of kids movies is based on the books by cartoonist Jeff Kinney, which follow not-so-brave hero Greg Heffley (played by Zachary Gordon) as he navigates the complexly awkward social mores of being a middle school student. While it's not exactly the type of film I'd get dressed up at midnight to see (my wife won't let me do that anymore since my recent costumed outing at The Avengers…), I can relate – life as a pre-teen is rough no matter what your generation. That being said, sitting through this adolescent romp was about as painful as enduring 7th grade gym class. For the wimpy hero's third film appearance, Heffley plans on enjoying a relaxing summer vacation with his friends – a plan that quickly goes to the dogs due to the usual embarrassing, swimsuit-related catastrophes that plague kids' movies. For some reason or another, Heffley fakes working at a local country club to escape his day-to-day humiliation, which puts him in the line of fire for snooty, white-track-suit-wearing socialites to lob their 1-percent snobbery. All in all, this one wasn't my cup of tea, but I get why kids would like it. The movie isn't breaking any ground in children's filmmaking, but that's not what 11-year olds really care about anyway. Child-friendly? For all of its stereotypically bad adolescent humor, Diary of a Wimpy Kid: Dog Days does manage to tackle those strange parts of growing up that we all went through. And considering that my own children are only a couple of years away from middle school, I'm sure they found the charmingly wimpy Heffley a compelling guide through puberty. Appropriate for kids of all ages.